Is there a danger, photographically-speaking, in spending too much time looking at the work of photographers we admire? I ask after I was struck by the similarities of a photo I'd taken to one by Ray Moore. At the taking stage, I wasn't conscious of Ray's image. Even after developing the film and scanning the neg into Photoshop it still didn't hit me. But when I was sitting having a morning coffee in McDonald's drive through and looking at some of Ray's photographs it stuck out like a sore thumb. 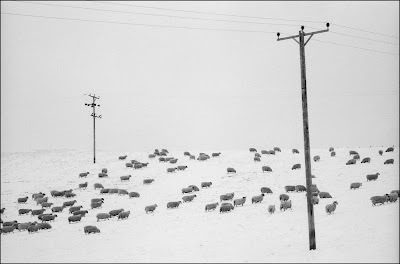 There is a strong similarity between the photographs from the elements in the frame - sheep, hill, telegraph pole(s) - to the weather (snow, blank sky), the format and the perspective. How heavily influenced must I have been from having viewed Ray's pic at some point in the past? I vaguely recall having seen his pic before so the image must have been imprinted somewhere on my brain. The question I asked myself was, "Would I have taken my photograph if I hadn't seen Ray's?" I remember the circumstances surrounding it quite well. It was a pretty grim day, snowy and very grey-looking. I'd dragged Cath out to the Carse with me so that she could push the car if we got stuck or dig me out of a snow drift*. I was driving up a hill in a quiet part of the countryside with no parking place on what was almost a single track and had little alternative but to stop in the middle of the road to take the shot. I certainly didn't fancy parking somewhere out of the way and walking a few hundreds yards back to this spot in the snow. I had Tmax 100 in the Contax and didn't have time to set the tripod up as I was sure, as almost always happens whenever I can't find a parking space and stop in the middle of the road to take a quick pic, that the complete ensemble from the Wacky Races would be along in a minute to tell me to get out of the way. I used the 100mm Sonnar hand-held at 1/30th and wide open at f3.5. "Cloudy dull" weather in my neck of the woods in winter and with 100 ISO film is 1/60th at f4. I gave it a stop more than that as it was 2 x cloudy and dull and the exposure was fine. There's no evidence of camera shake in the scan that I can see. It was a good shot of the Carse in the winter as it showed the type of conditions we can get along with some of the sheep farming that goes on. That was my motivation for taking it. But, I've no recollection of saying to myself at any point, "This one will be just like one of Ray's". I suppose it's almost impossible to avoid being influenced by our photographic heroes and that needn't be a bad thing as long as we don't set out to consciously copy their work. I can honestly say that Ray's pic didn't enter into things as I stood there freezing in the snow, trying to keep the camera steady. Of the two photographs, I prefer Ray's. I like his placement of the pole in the centre of the frame which makes for a more interesting composition. My composition is more clasically-balanced but lacks the edginess of Ray's image. This "balancing" is something I have to fight against as it can make the photograph a bit dull or unexciting. I've noticed that Ray sometimes has the subject matter in his photographs to the left and centre of his frame with the right side almost devoid of interest. I've no idea if this was something he did on purpose or just the way he saw the world. I have my own theory about photography and that is that we improve by studying those images we like until they become burned into our subconscious. We absorb the elements that make them, in our eyes, a success. Then, when we're out and about, some or all of those elements appear before us in a scene and a wee alarm bell goes off in our heads followed by a voice whispering, "You have the elements for a successful photo before you. Get the camera out." Ironically, my photography really improved when I stopped buying "how to" books and started buying books that only had the work of other photographers in them. I'd stare at these images for ages in the same way I studied Ray Moore's output on the iPad. 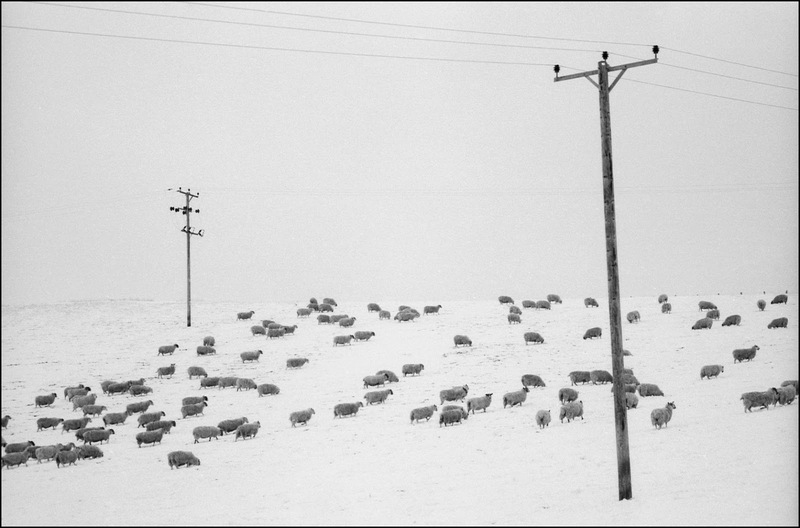 During that time, I've moved away from admiring the Ansel Adams-type of photograph towards the likes of Ralph Gibson, James Ravilious and Ray. In other words, it's the 35mm aesthetic that floats my boat rather than the dead sharp and grain free. Returning to the subject of this post, I suppose I'll be fine as long as the inspiration for my photography remains in the subconscious. If I ever stand before a scene and say to myself, "This is just like that pic by Mr X," then I'll probably be in trouble. 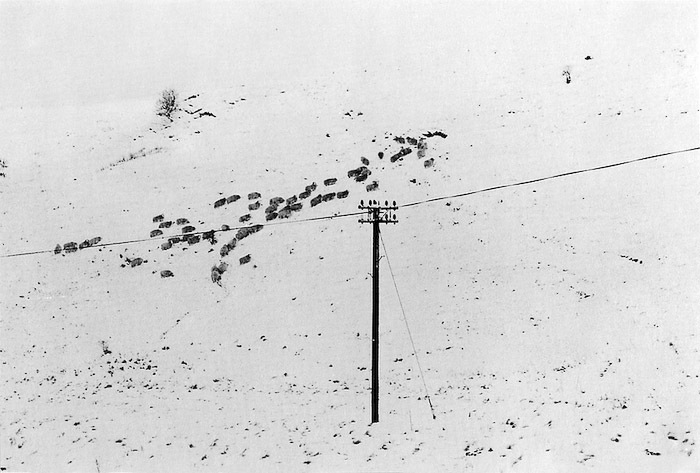 And would I have taken my snowy sheep shot if I hadn't seen Ray's work? Yes, I'd like to think I would have. * Humour alert. Thought I'd better make that clear in case someone tried to report me to misogynists' anonymous. If your wonderful Cathy's tough enough to push a Volvo up a hill in the snow, she's tough enough to keep you in order. 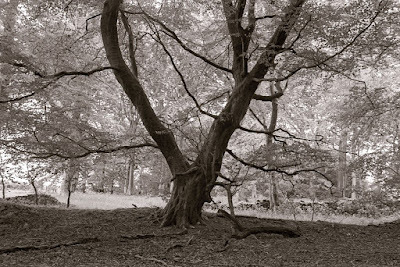 I once had the experience of recognising an image I was about to make: "Fay Godwin, Stourhead Lake 1983." I walked on, but I was quite pleased to have seen it. I checked afterwards, and I'd have made an almost exact duplicate. Looking at images might do two things. I'm sure you've avoided the first tempting path, of collecting examples to copy – a sunset on the thirds here, a Big Stopper pole sticking out of a lake of grey milk there. Perhaps, the second path gives your eye practice in looking and absorbing how a picture works – how it gets to the point where we can call it an image without blushing. The more you look, the better the eye gets. The first way, the worse it gets. I think that's where all the pictures taken from AA's tripod holes come from. Very tricky to copy Ray Moore deliberately, I'd have thought. So many of his pictures seem to be about "nothing." 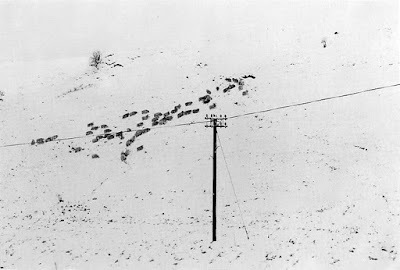 * Listen mate, you've not lived till you have tried to push a Vauxhall Viva ('70's style) up a steep farm track covered with 4 or 5 inches of snow, using only tattie sacks for traction. That poor wife of yours . . . . ! As for influence, well, there's nothing truly original any more is there really, all we can hope is that our take on non-originality can somehow look good. And yours does. That's a good picture of sheep, so is Ray's. Influences have a way of bedding down - it's a way of learning that applies to pretty much all creative pursuits - nothing wrong with it. I think what counts is your take on it. There was no conscious decision on your behalf, and I seriously doubt Ray's picture was in your mind at all, anywhere. It was happenstance. You were there. Liked the look of it, stopped and took a picture that just somehow happened to be like Rays'. Totally agree about the "how to do it" books. Having said that, there are a few keepers by the likes of Barry Thornton, Ansel Adams and David Vestal but as David says, they are there for reference mainly. Meanwhile the rest of the house groans under the weight of individual photographer monographs which are a joy to look at and inspirational when I'm going through a dry spell. I don't quite agree Herman that there is no scope for truly original work and that it has all been done before, I think you are unduly pessimistic. Human creativity is such that someone will come along with a truly original vision and turn everything on its head again. Hi Nick - not at all pessimistic, honestly, but the world is so awash with imagery, I seriously doubt there's any viewpoint left that hasn't been done. All you can do is photograph in a way that is pleasing to your eye, which'll probably change over time anyway. The days of Adams and White and Evans (where someone's distinct view of the world was so good, and presented so well, that it was enough to influence generations) are, I genuinely believe, gone. I would love to be proven wrong, but it is just my pragmatic view of things. I've given up looking at a lot of 'modern' photography, simply because I get nothing from it, it seems to be a variation on the (skewed every time) document in a photocopier, churning out endless variations on the same, just a little bit different. I mean, take those subject standing straight, looking at the camera, portraits, that seem to appear in BJP all the time from some new wunderkind - I remember seeing those in there back in the early 1980's and they haven't changed that much, they're the same just the same but nearly 40 years down the line. Nothing new is being said photographically - a skinhead family then, is a skinhead family now, except now the poverty has been replaced with a new aesthetic. The picture tells us something of how the times have changed, but photographically stylistically, it is cast in amber. Rather like music (which I've sold for 35 years to the general public) the saturation of a hobby-art is such, that with such a large world population, so much history of catalogue, such ease of making images and such a large uptake, can there be anything left still to be said and done? All you can do is go and make photographs and enjoy what you're doing. It probably won't be original, but if it pleases the soul and makes someone invest some time and effort into producing something which gives such great pleasure, then that is all that matters. Hope you don't think I am being too soap-boxish, and brushing off your comments - I never mean to be like that - it is just my take on things and I have thought about this a hell of a lot . .
Have a butchers if you like! Oh and I agree on photographic books vs. ‘instructional’ material - the very best manage to cross that ground without being in any way dry. You’ve maybe seen it, but John Blackemore’s Photography Workshop book is a corker. Wish someone would reprint it actually. You've tipped me to Raymond Moore a couple of times. I watched the whole three part video; this guy was a surreal artist. Mann Ray doesn't have anything on him. You know what David - I'll sit here with you and wait - could you pass me that flask please if you don't mind . . .
Been sitting here for a while now. Just made a fresh pot of coffee. So far, no originality. Soon I might have to get up and do something to relieve the backache. Actually, I shall have to get up to buy more coffee. Would I miss something? Searching for originality isn't as easy as it looks. I might take some pictures while I'm waiting. There is a sensible question in here. When someone does something original in the creative world, do they know it's original? Are they simply following their noses down an unknown path and arrive at a place they didn't expect? It's probably obvious if you invent gravity or the telephone, but a different kind of photograph? Did the chap who invented the wheel think he'd just made a small improvement to rollers, or did he jump on his new cart shouting "Ug-reka!"? So, John, what did you make of Ray's work? Is it your cup of tea or just too surreal for your taste? Bruce, at first I was 'what is this guy doing.' It looked like he tripped the shutter by accident, and what calling it art. But the more I looked (with a little guidance from you), I could see what he was doing. And he seemed to stick to it. One of the You tube videos at the end said his work is locked up, so no exhibitions, etc. I do like his images. David - I don't necessarily think the creator would think of it as being original. It's just their slant on the medium - self expression (whatever that is) . . enjoying oneself in the process of creation - bit like reproduction really. All the 'progeny' come out different but you’d still know they were yours. It is then up to 'society' to deem whether they be original or not. Everything is original if you think about it, but some things are truly different in the way they're put together and it is these points of reference that come down to us through the ages. This being said, the terms of reference these days are SO broad, so much has been created, can you truly say that something you’ve created is truly different and not just like something that has come before. I suppose at the end of the day what counts is that YOU are making something and enjoying doing it - just don’t think that what you’re doing is original, because in the terms of reference to everything else, it probably isn’t. Have fun, get your hands dirty and just enjoy the process of creativity for what it is. Have you got a Tunnocks Teacake to go with that coffee then? Herman, your comments were very civil, no problem at all, we are a very polite bunch in the darkroom, unlike some other fora, which I don't even bother to visit any more. The problem with imagery has been summed up rather succinctly by the artist Grayson Perry who likened digital photography to sewage, there's just so much of it that it's hard to find the good stuff. That's not anti-digital either, it's a problem of sheer volume and mediocrity. I think if you become too self-conscious about other people's work you can suffer from a kind of paralysis. All the best to everyone. I doubt if there's a higher proportion of rubbish today. It's just so much easier to spread it around.